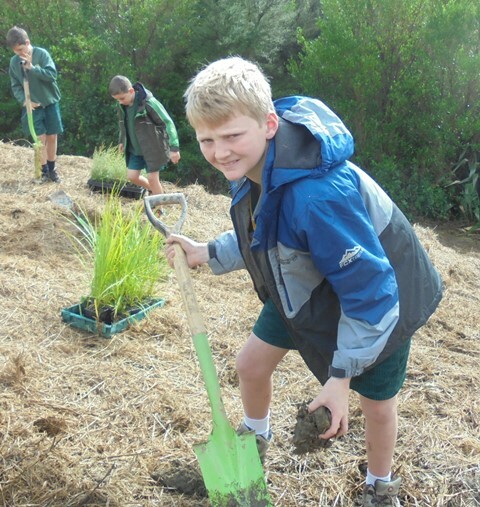 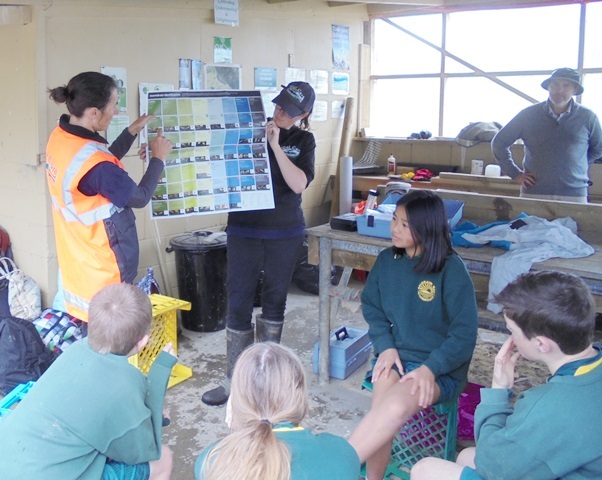 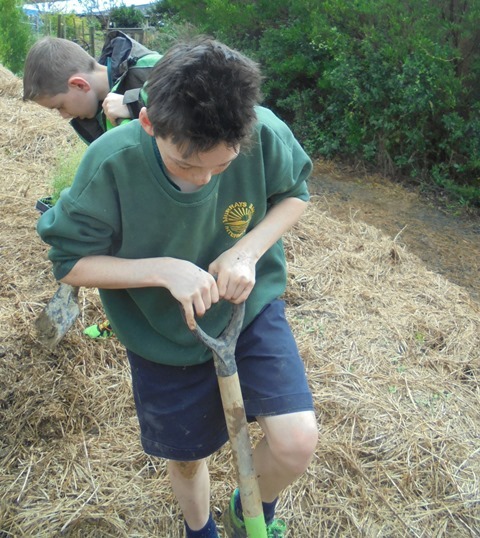 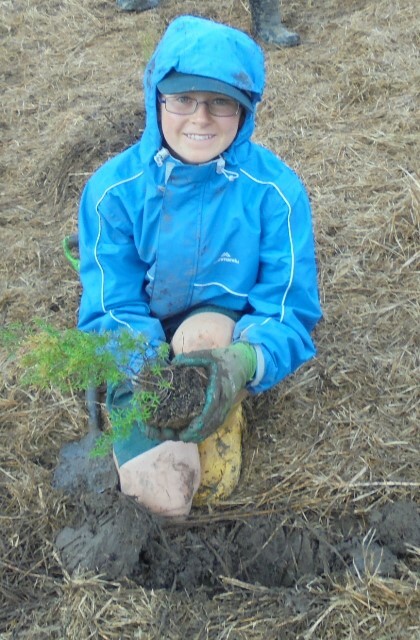 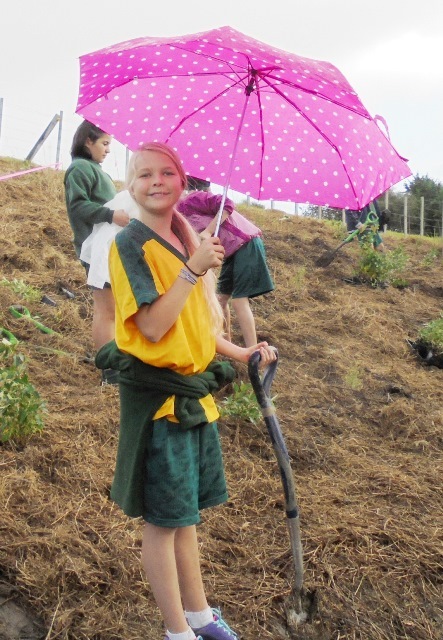 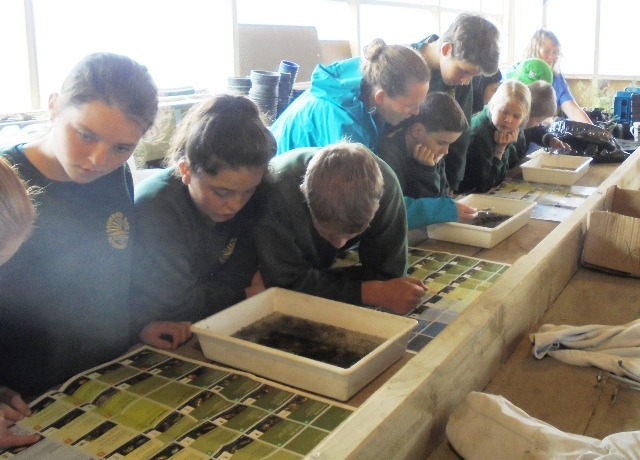 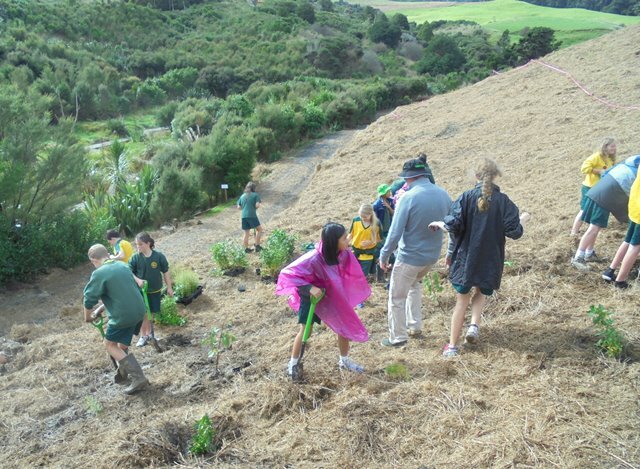 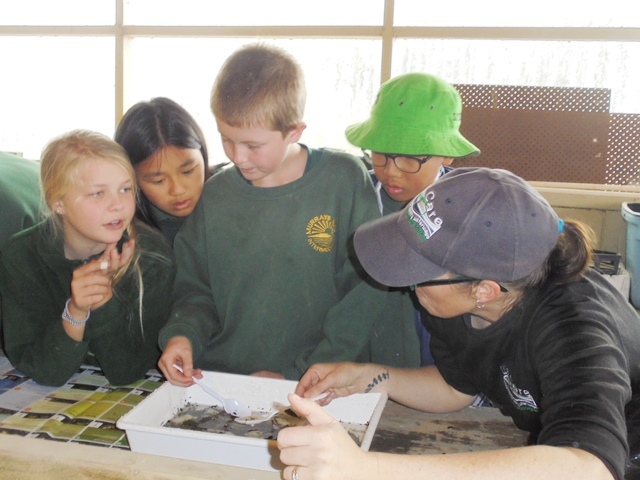 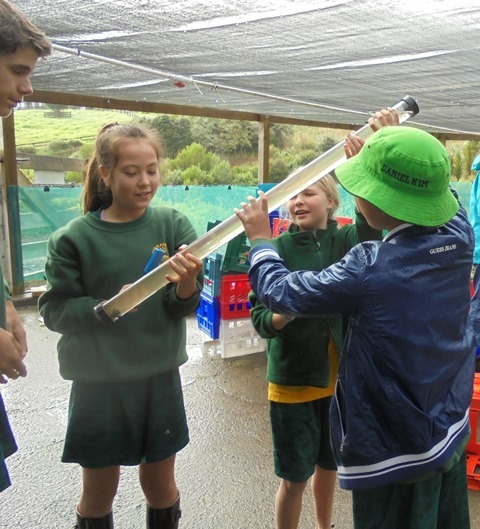 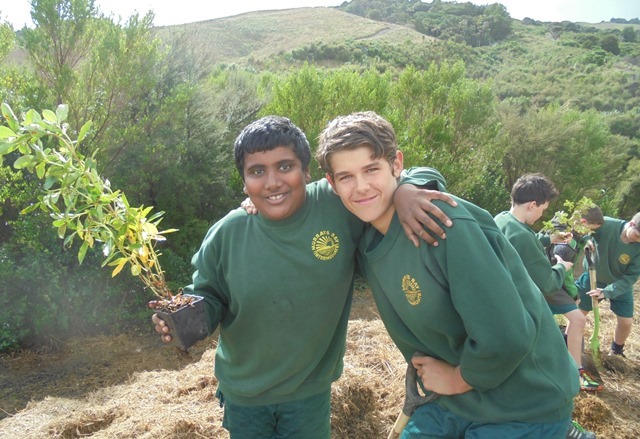 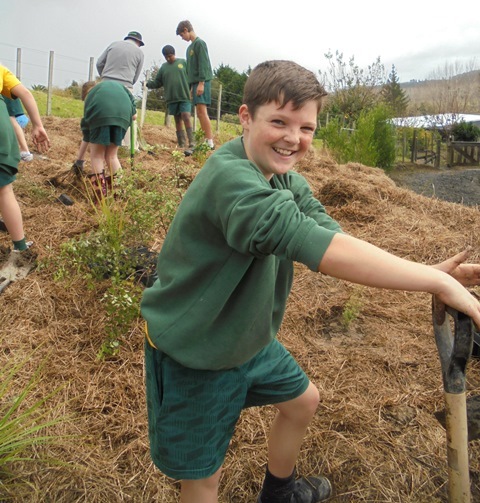 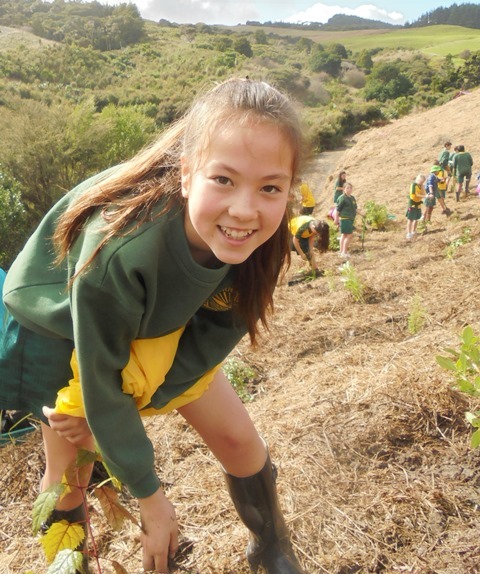 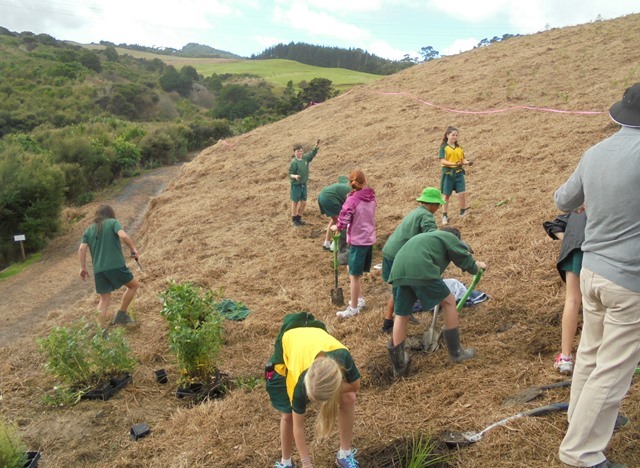 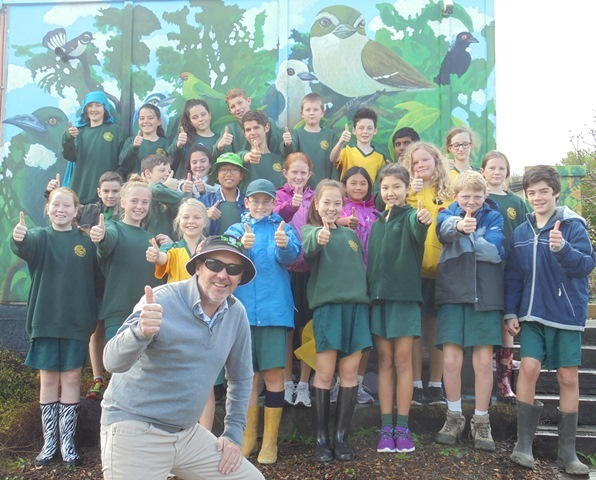 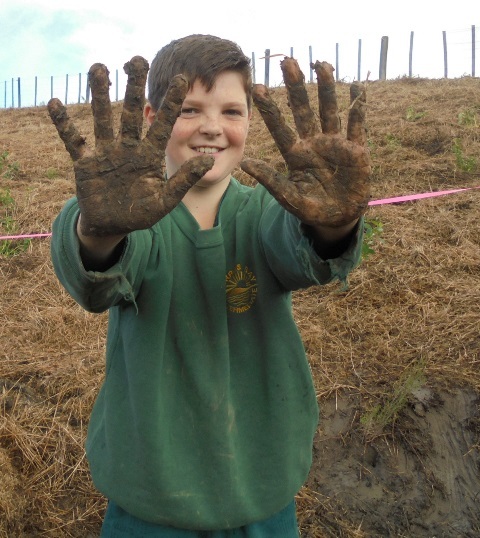 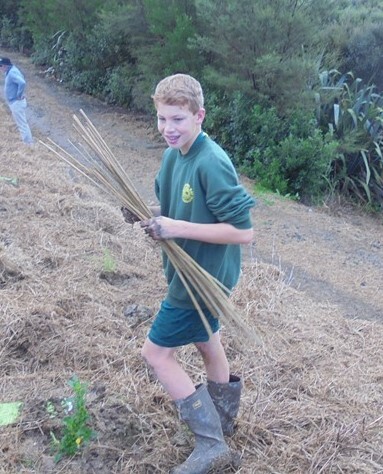 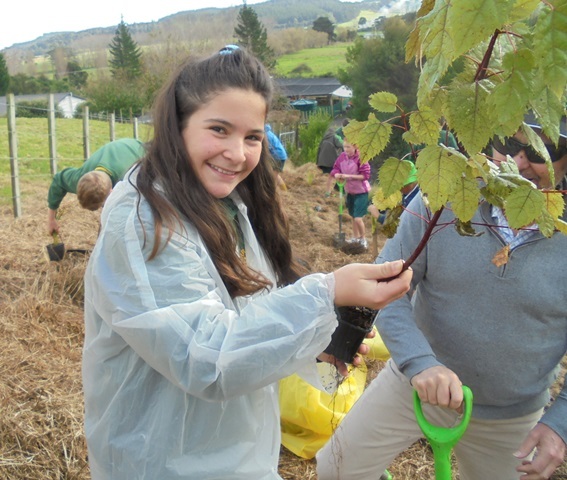 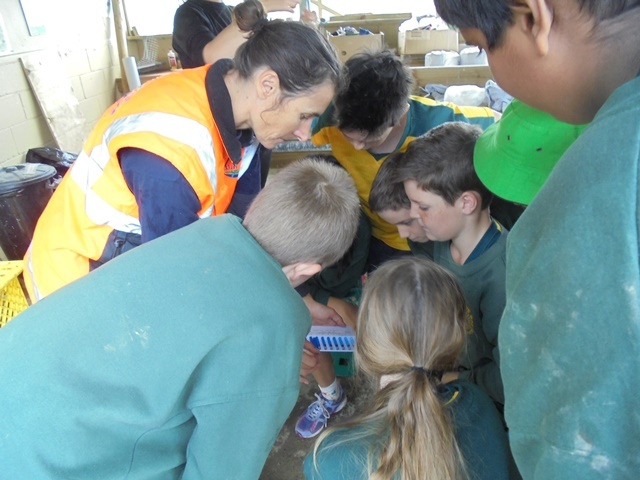 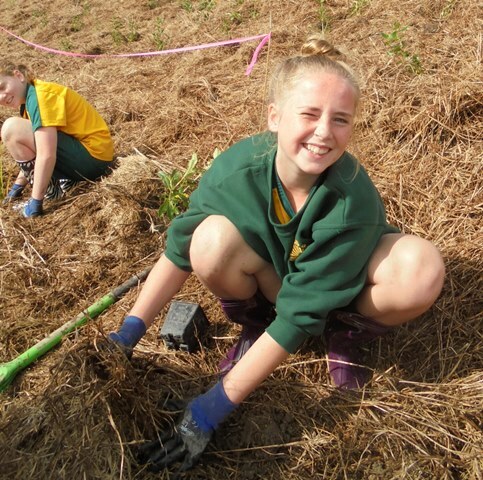 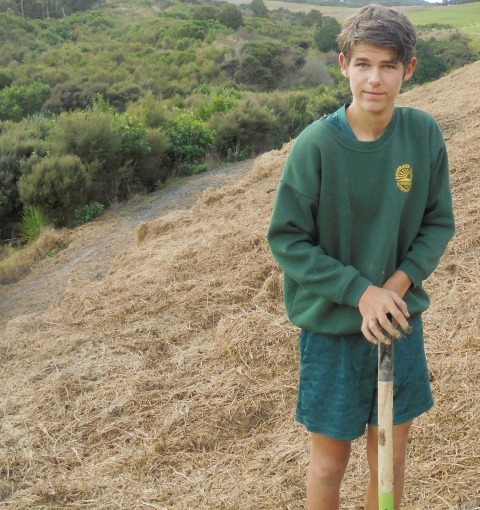 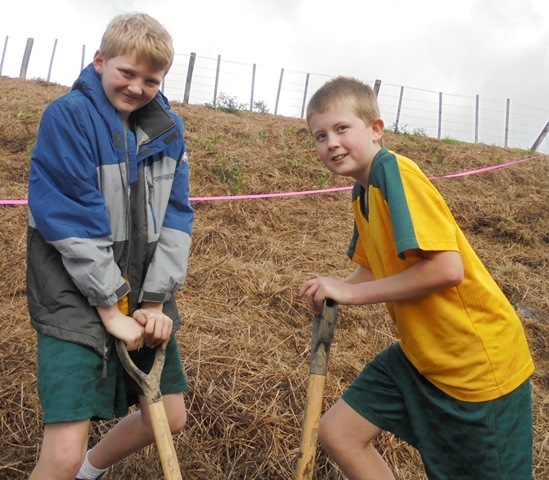 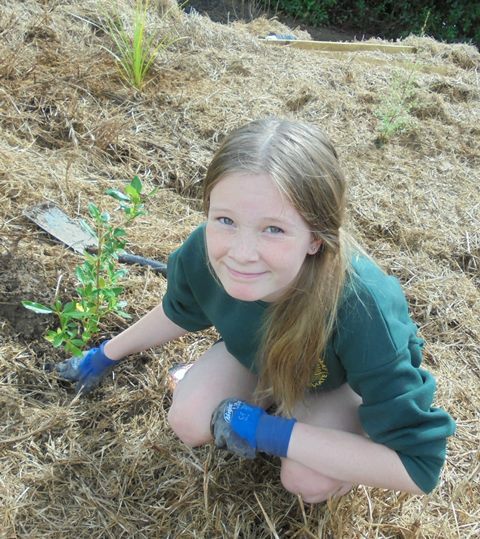 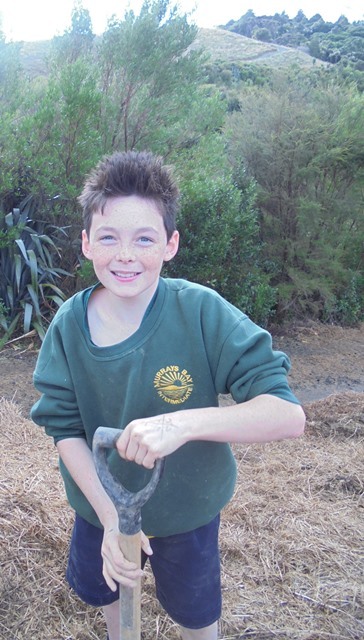 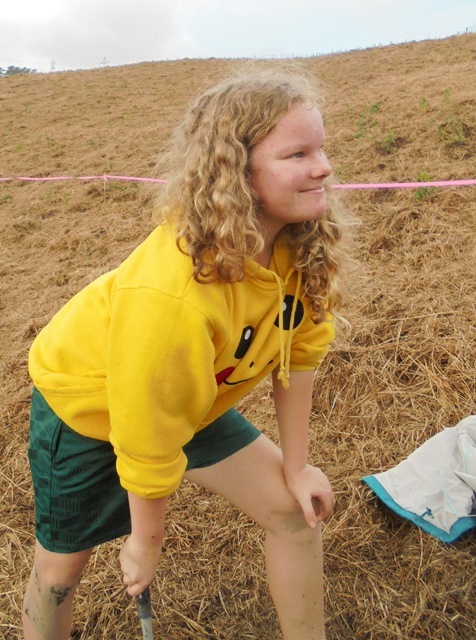 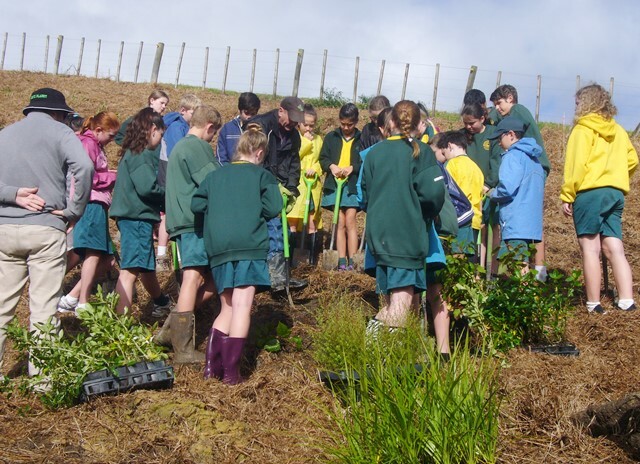 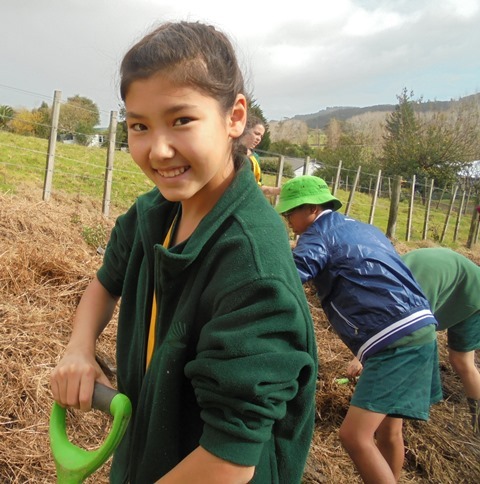 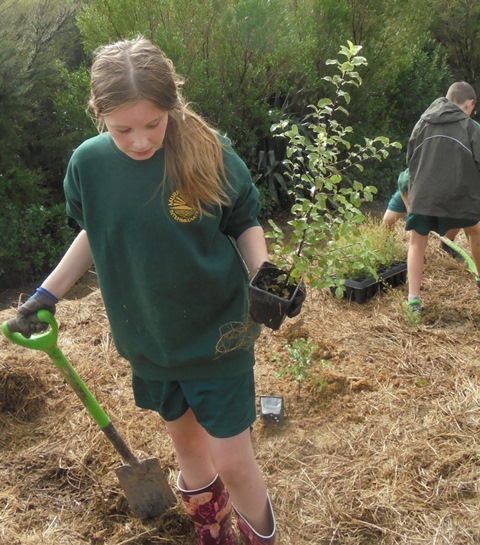 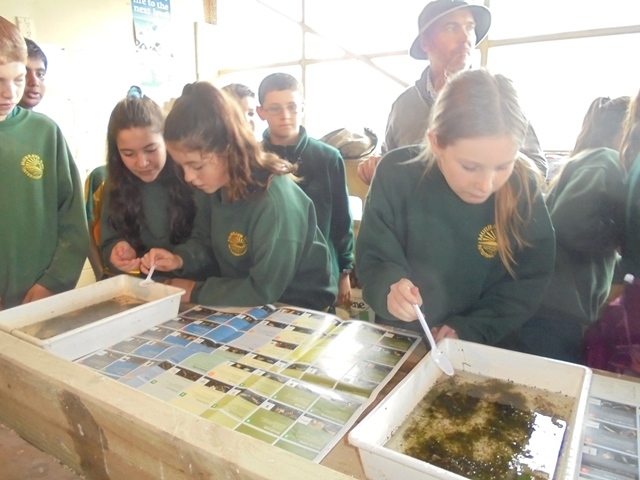 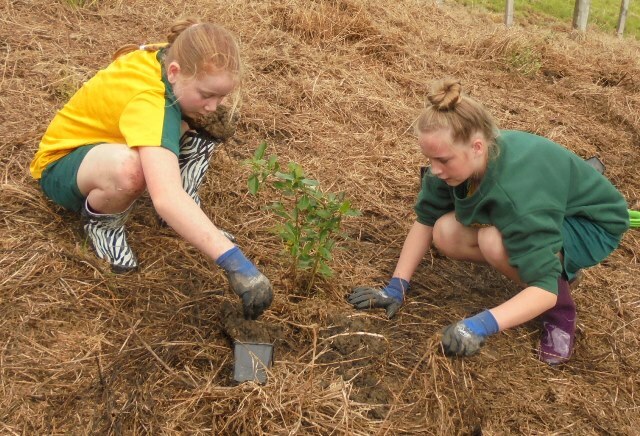 Today David Walker, science and sustainability teacher at Murrays Bay Intermediate School in Auckland, brought out a group of twenty five Year Seven and Eight students for a day of planting and exploring. 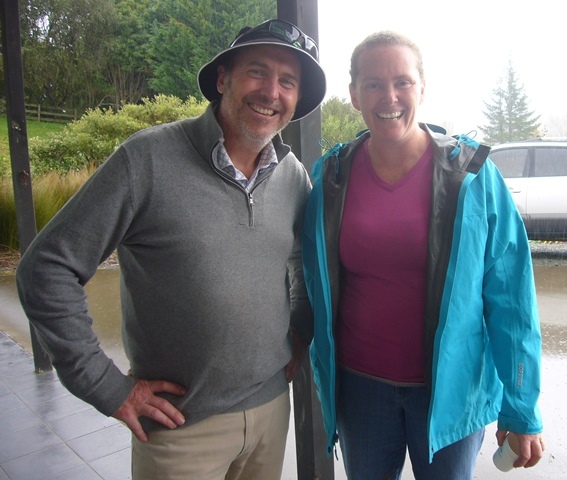 Also accompanying the group today was parent Gretel Roberts. 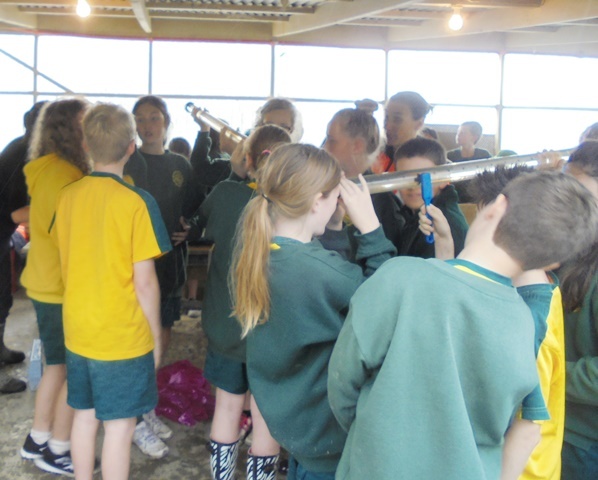 This is the fifth time students from Murrays Bay have been out to CUE Haven and we really enjoy their visits. 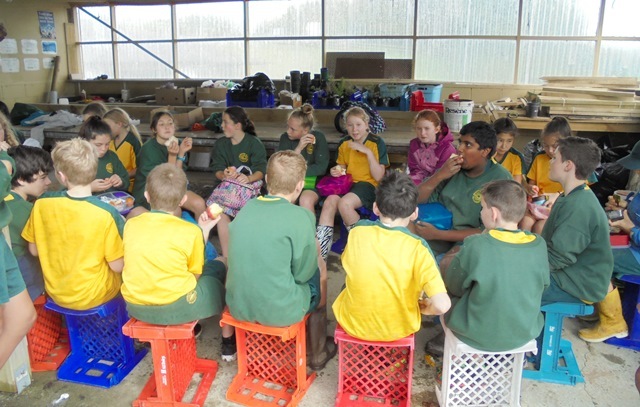 We started out with morning tea. 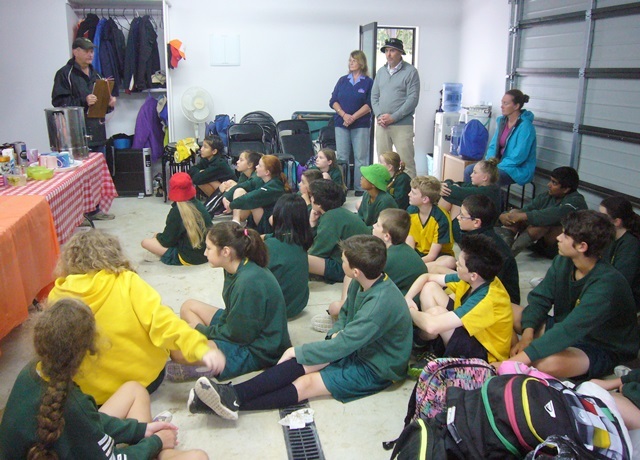 David gave an overview of the objectives for the day and Mahrukh told the students about the CUE Haven project and what we are doing and hope to accomplish. 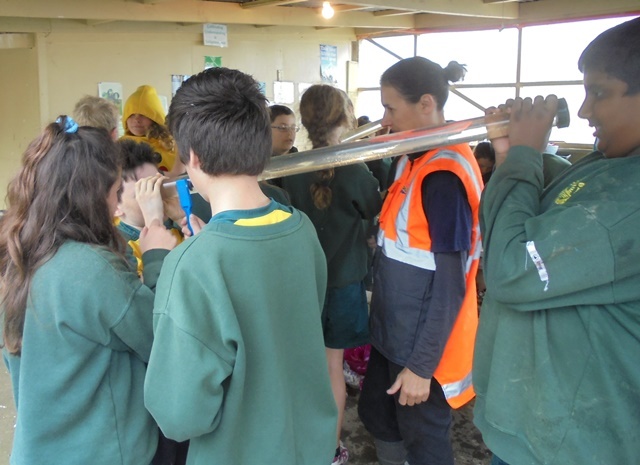 Thomas then gave a safety briefing. 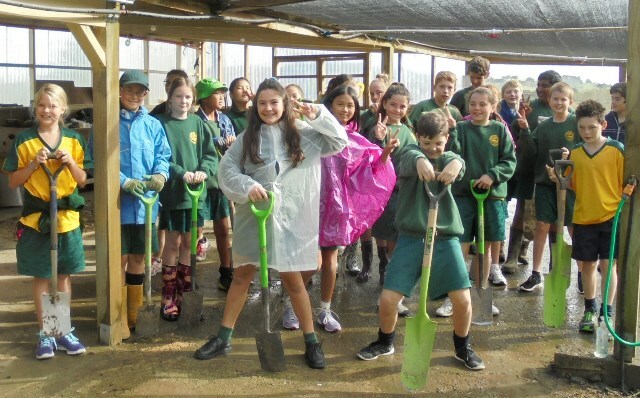 The group then went to the nursery to pick up spades and gloves and then we went out to the planting area. 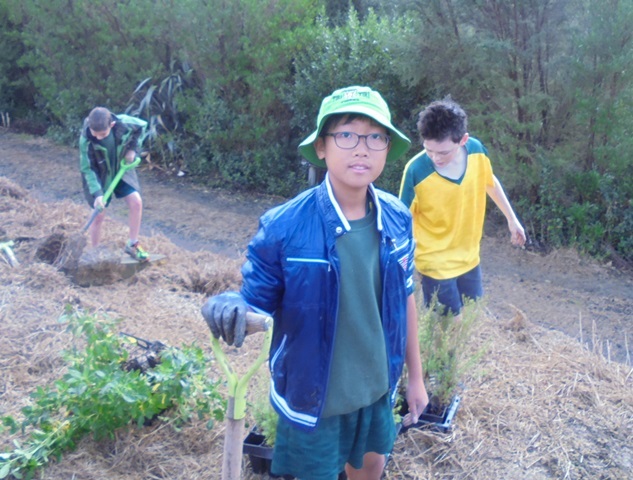 Once at the planting site, Thomas identified the different trees that the students would be planting and gave a planting demo. 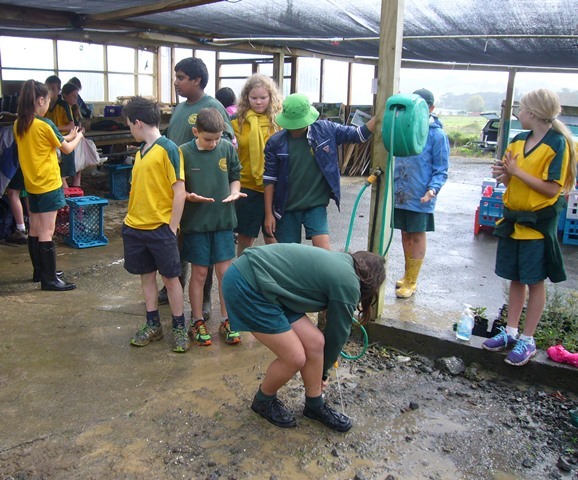 And then the students went to work. 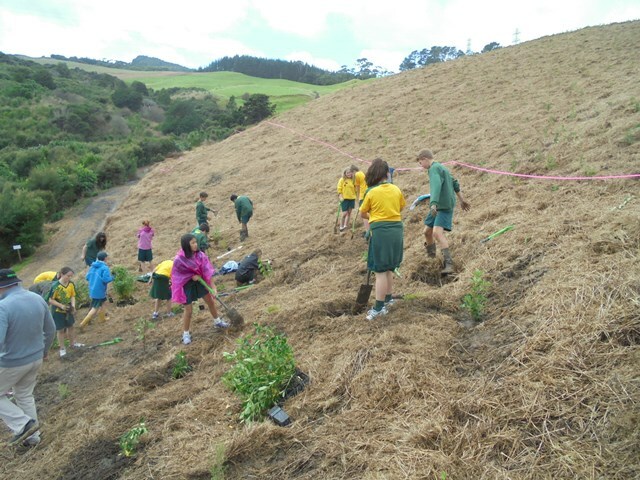 It was a bit of a challenge on the uneven ground covered with dead weed grass but it didn’t slow the group down. 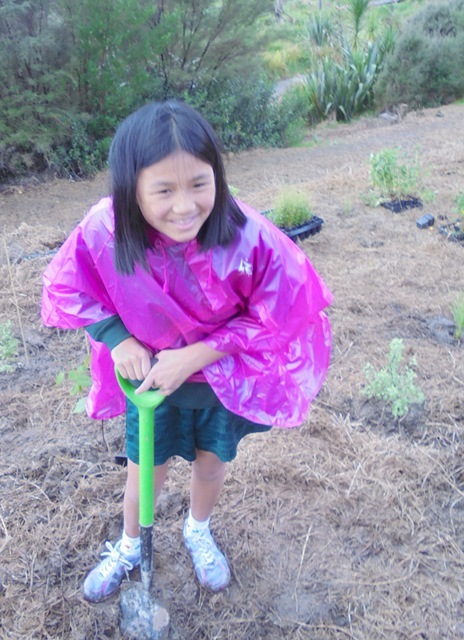 The weather was totally changeable. 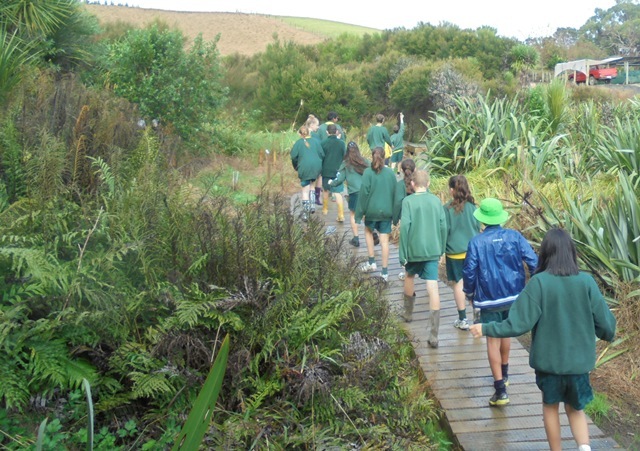 We would get periods of bright sunshine mixed with heavy showers, but everyone was well prepared and the group coped very well. 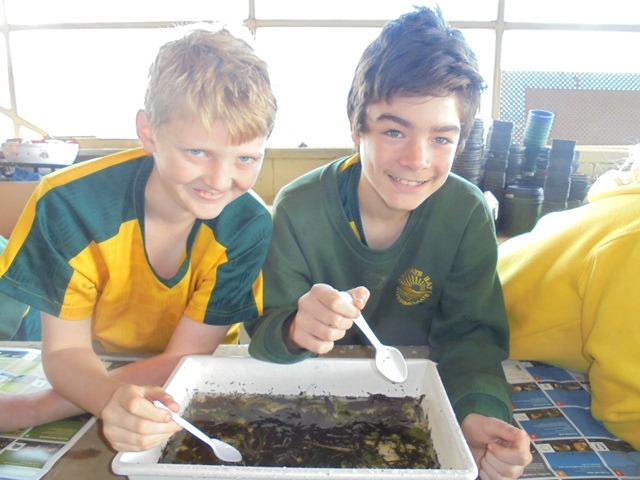 The students found lots of worms and snails and skinks in the rich soil. 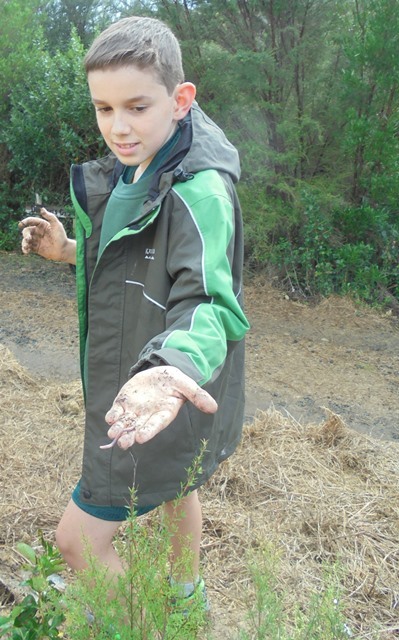 And it didn’t take long for everyone’s hands to get dirty. 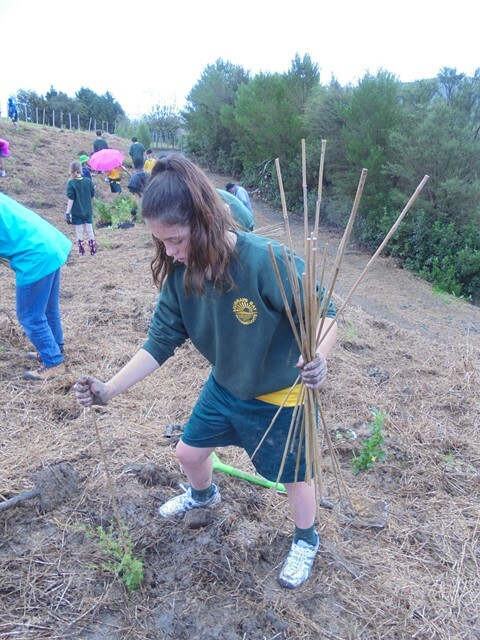 Once the planting was finished, the students put a bamboo stick next to each plant so that we will be able to find the trees this summer when the weeds grow up around them. 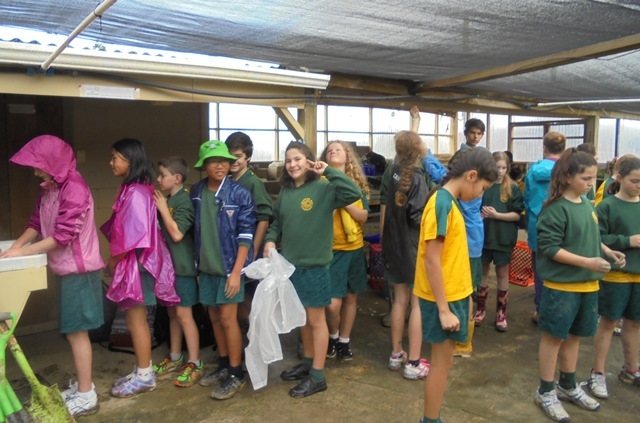 The students also gathered up all the empty pots and trays for recycling. 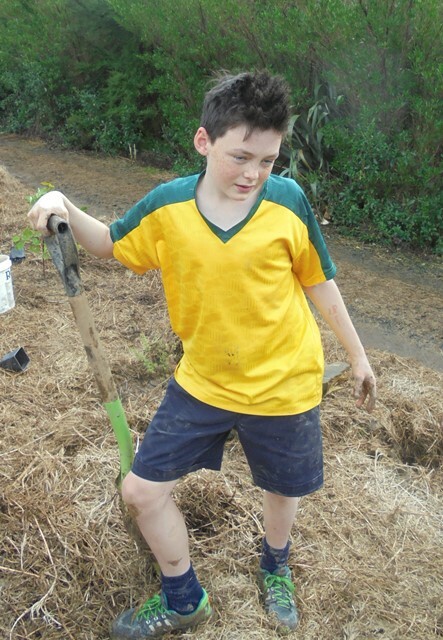 And then headed to the nursery to clean up and have lunch. 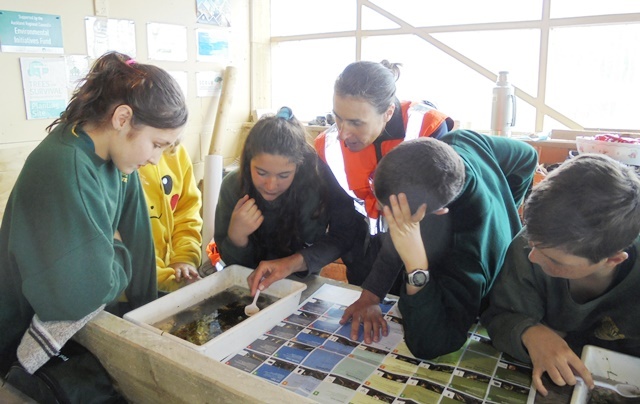 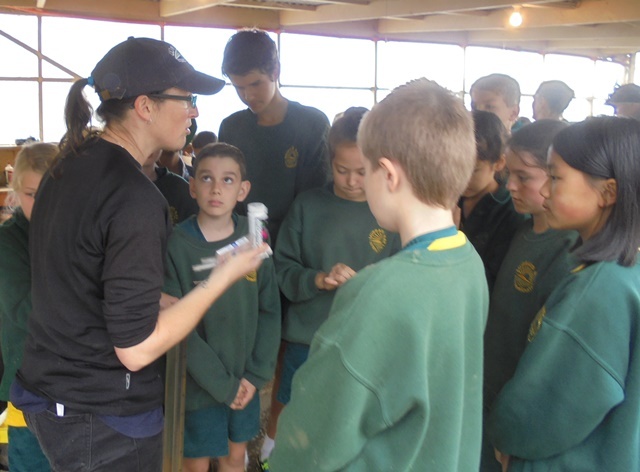 After lunch, Rachel Griffiths and Shelly Hackett of the Auckland Council WaiCare education programme gave the students a presentation on water quality issues and a demonstration on water testing. 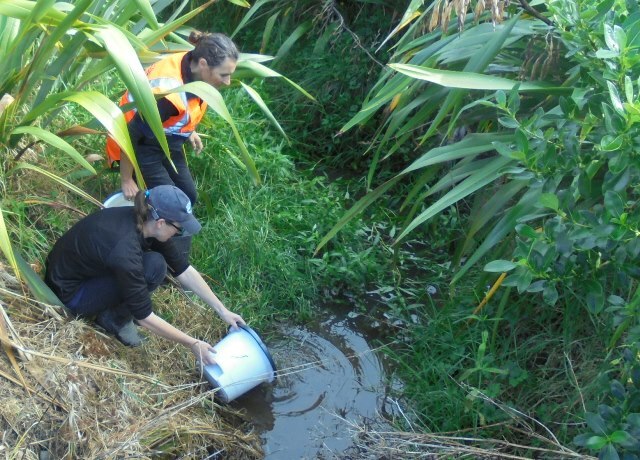 Rachel and Shelley had previously gone out and collected water samples from two stream areas on the property. 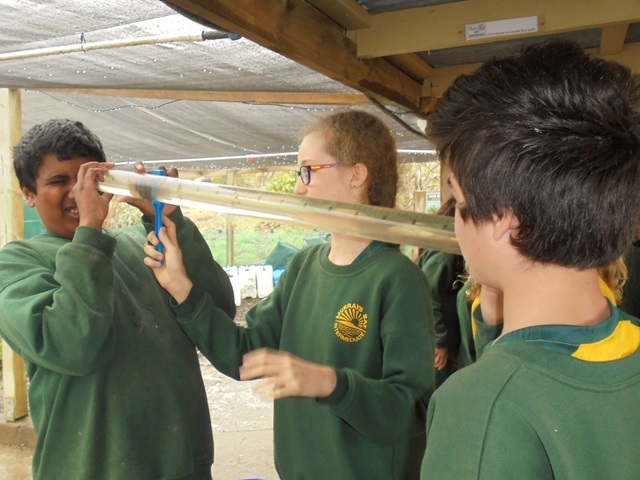 The students learned how to test water quality and participated in testing the water samples for temperature, pH levels, dissolved oxygen and clarity. 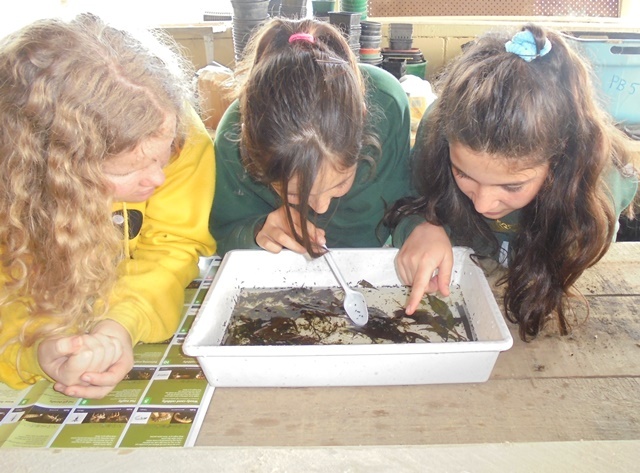 Shelly and Rachel explained why each of those factors is important to water quality and maintaining healthy waterways. 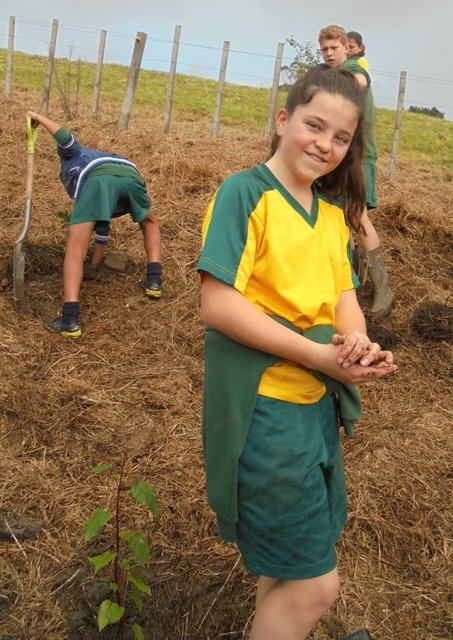 They also discussed how the shade provided by the trees we have been planting was affecting the water quality. 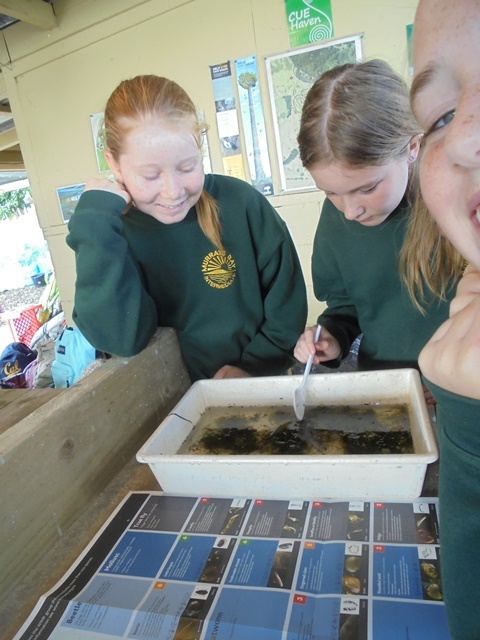 Rachel and Shelly had also collected some pond vegetation in the hope of finding some creatures, known as macroinvertebrates. 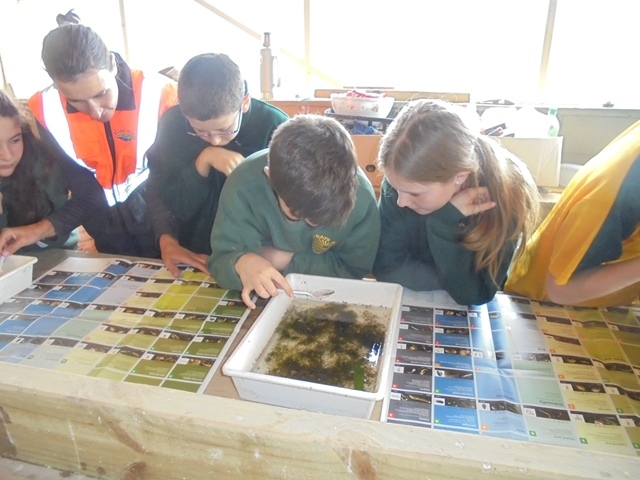 The type and variety of animals found are a further indication of the health of the streams. 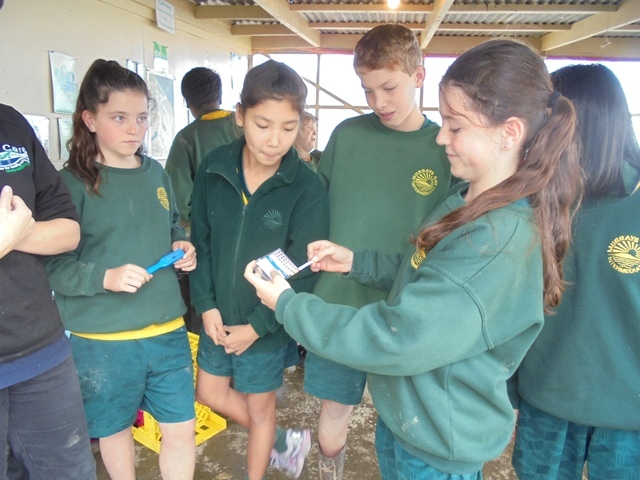 They explained how to identify the creatures and gave the students a chance to see how many they could find. 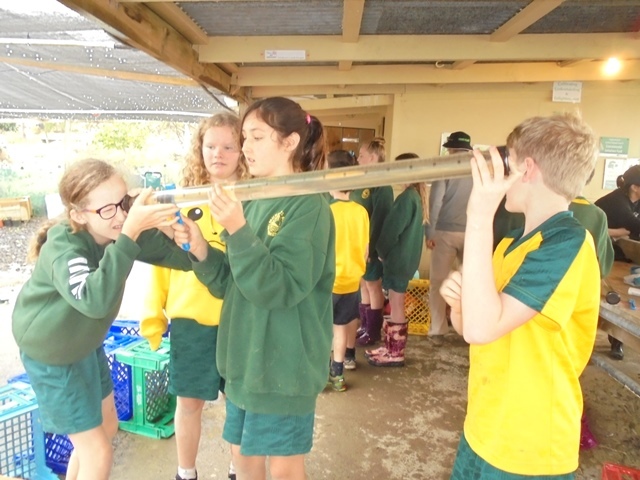 The group broke into smaller teams so that everyone could do the experiments and observations. 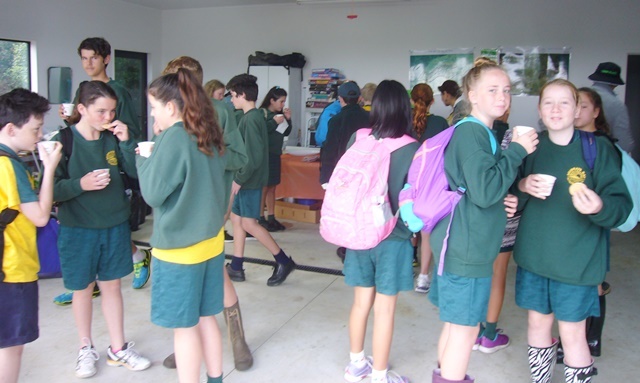 We’d like to thank Nestle NZ for providing the much enjoyed Nestle Hot Chocolate for the students and for the Nestle Café Menu sachets which were appreciated by the adults. 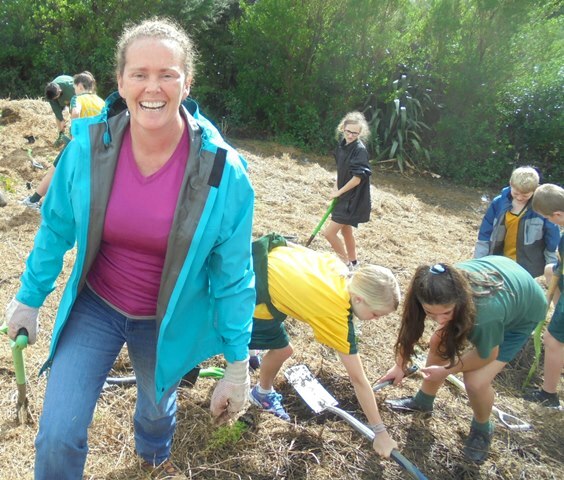 And a special thank you to Karen, who drives the school bus. 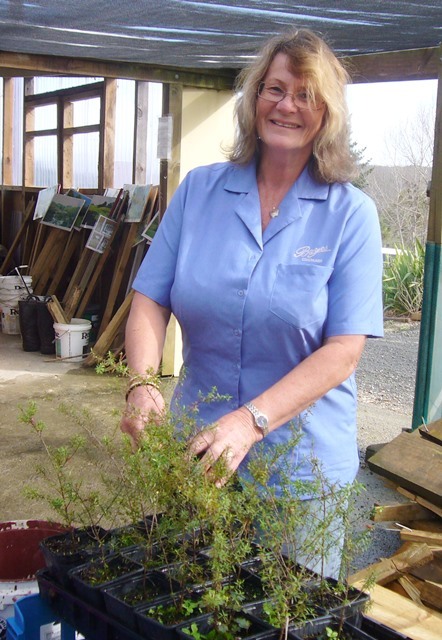 Karen has brought out all of the Murrays Bay groups over the years and has become a good friend. 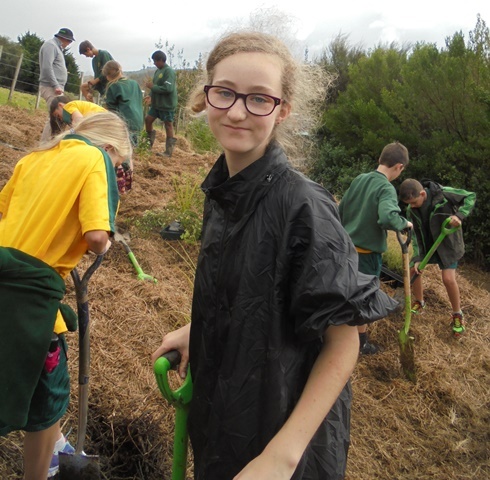 And instead of relaxing while the students are working she insists on helping out and we are really grateful for her help. 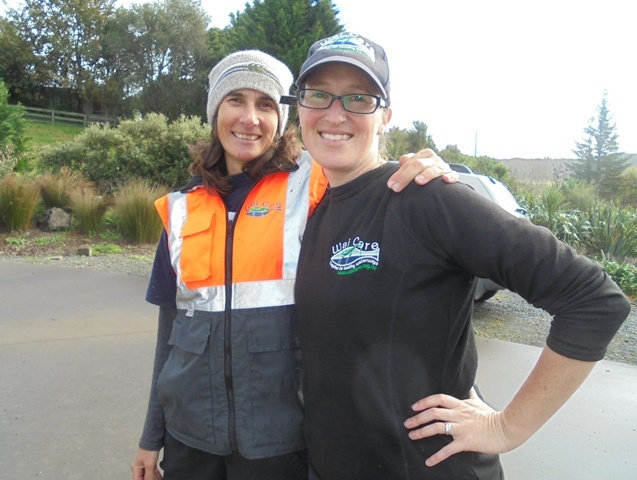 And many thanks to Rachel and Shelley for their excellent Waicare session and also for their helpful guidance and advice. 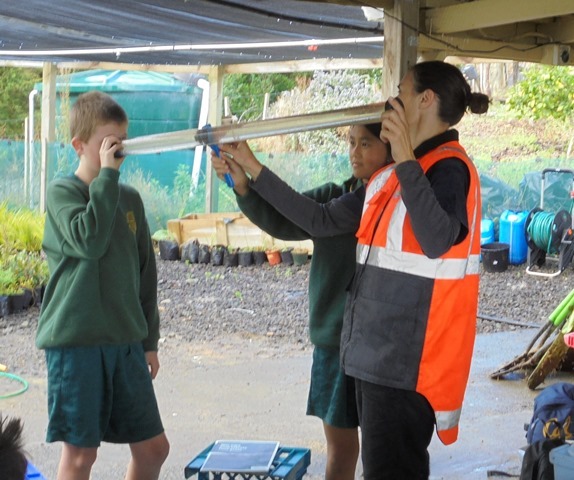 And thanks, too, to the Auckland Council Waicare programme for their continued support of CUE Haven and for enabling their educators to contribute to the project. 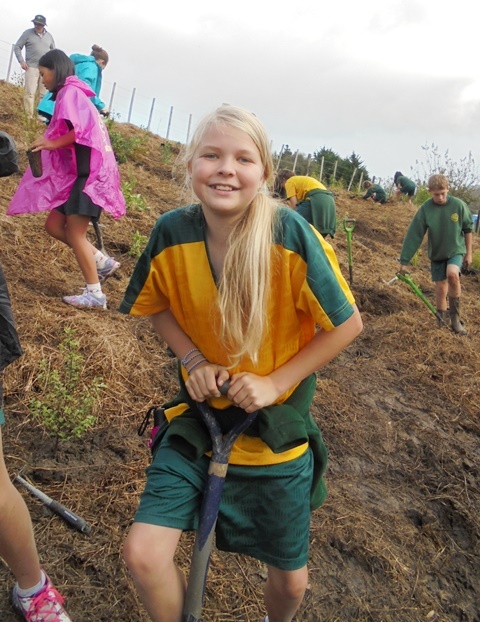 And a big thank you to David for bringing out the students and to Gretel for giving up a day and helping out. 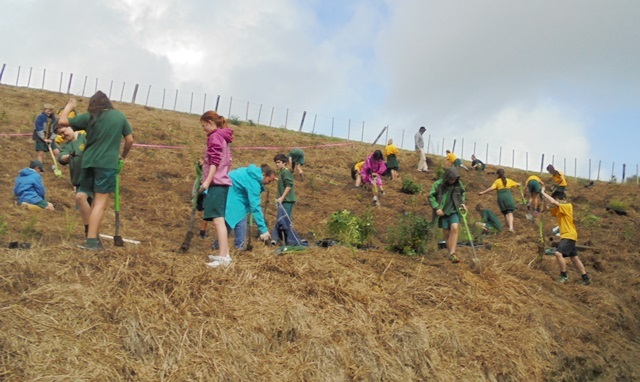 We really appreciate your interest and support. 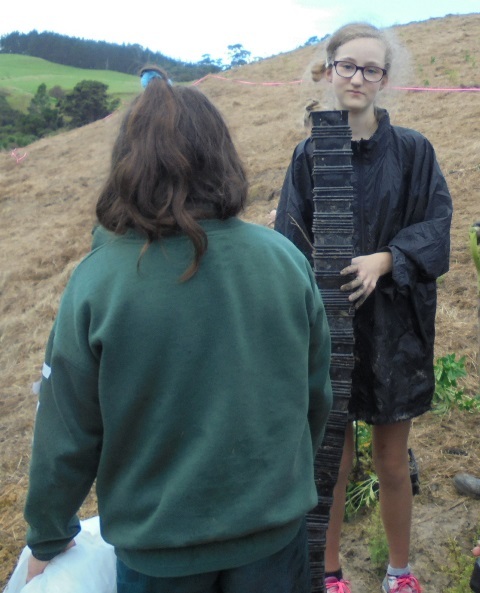 And most of all, a very BIG THANK YOU to the hard working students. 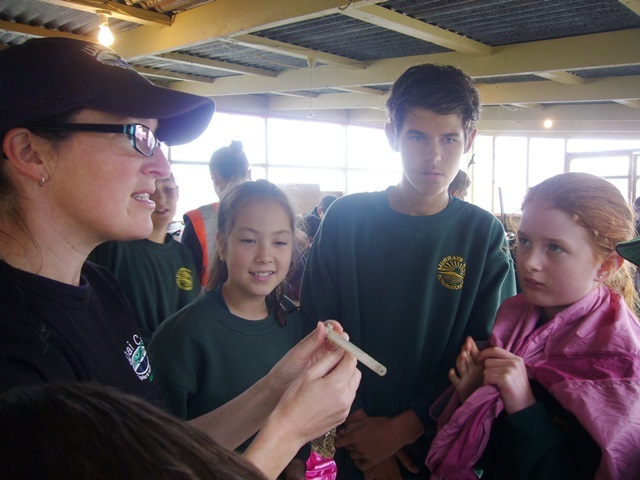 It was fun having you all out to CUE Haven and we hope you had a good time and learned a lot. 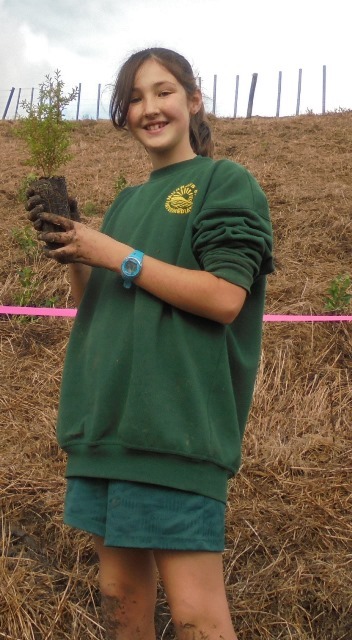 Thank you for planting the trees today. 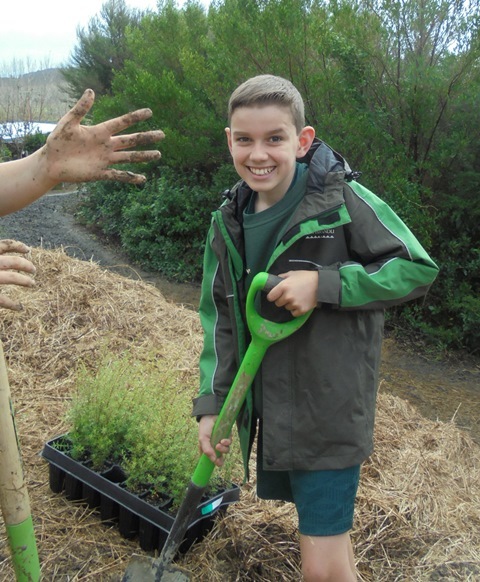 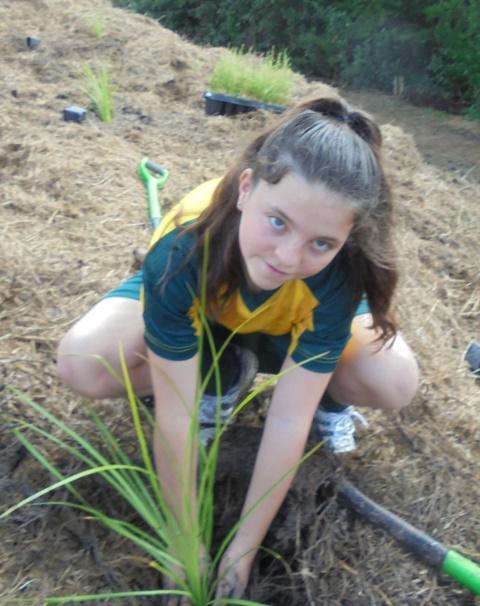 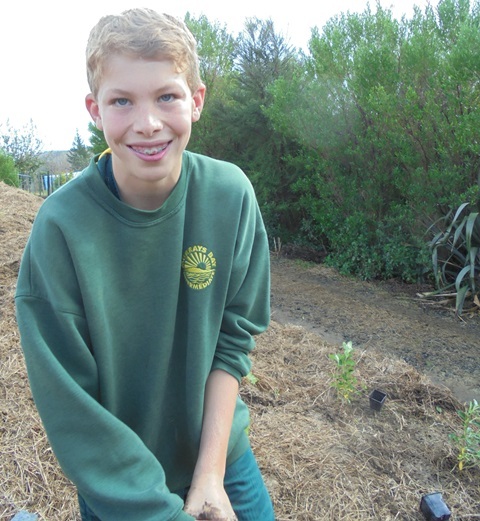 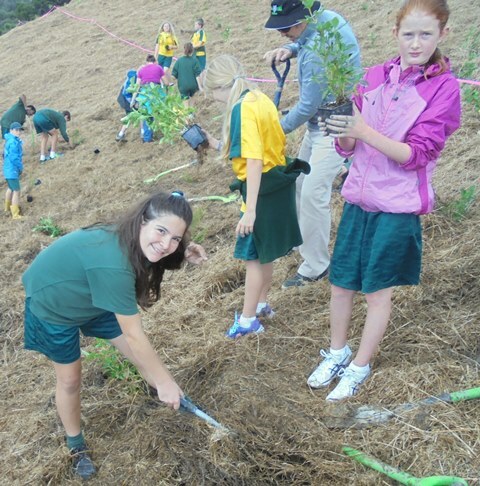 You have made an important contribution to the CUE Haven restoration project and your trees will form part of the native forest we are all creating together for current and future generations. 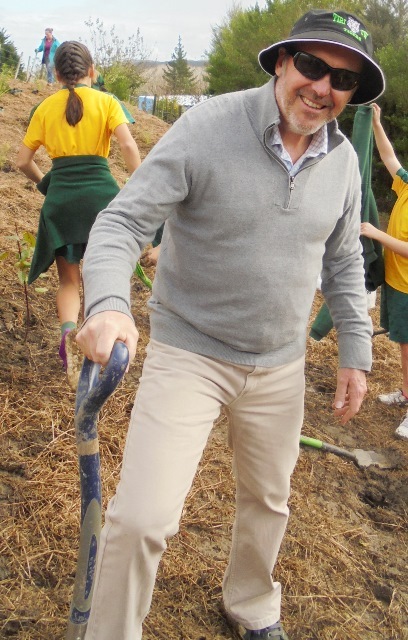 We wish you all the best and we’re looking forward to your next visit.